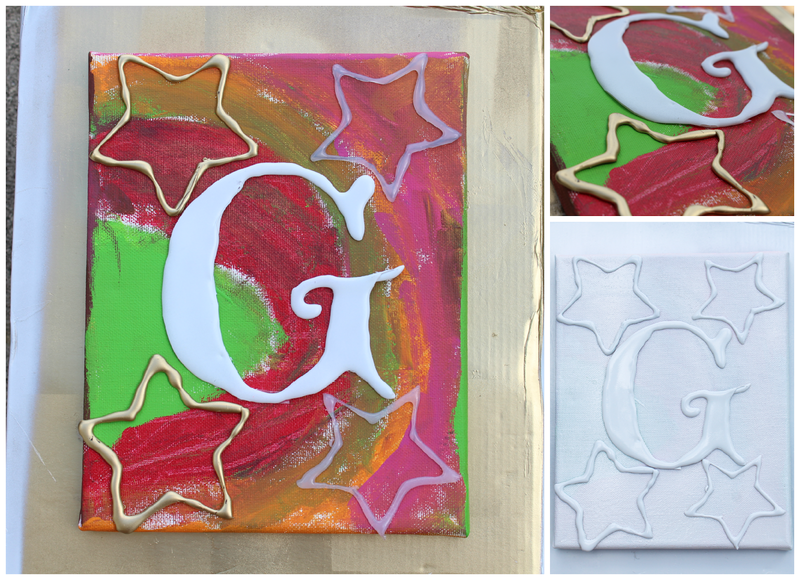 Last week's post I shared how to create stencils using a glue gun and glue sticks and today I am going to show you the letter I created. 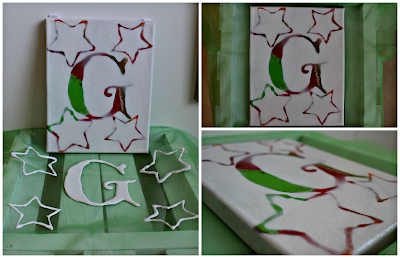 This fun project I created to make a personal monogram wall art for my girl's room. Using PicMonkey I created the letter "G" using the font Emily's Candy and printed it off. I then placed a piece of parchment paper over the print and using my hot glue gun I traced the letter. Tracing the letter was very easy and the stencil turned out great. I have another great idea on how to reuse this letter as well. I placed the letters and some stars I created on the art work and spray painted the canvas in white and Voila! You have a fabulous monogram art work. This piece turned out so sweet and I love the font I picked out. The room is coming together and the reveal is next week. Can't wait to share. Enjoy your day! This is a creative way to personalize a kids room. Love how you used the different colors in the underlayer:) Pinning! Definitely! A cute way to make the walls pop! That's awesome! I can't believe you traced the G out of glue. You must have super steady hands! That came out awesome. I absolutely love it. what a beautiful room decor. I would love to do this for my son. So cute, can't wait to see the finished room! Such a cute craft and easy to personalize for each child. This is such an awesome project. I wish I could do something like this for my daughter. This is adorable. I was thinking of a cute way to monogram some art for my daughters nursery. This will be perfect. It's very unique which is absolutely my favorite thing about it. Thank you for sharing it! Really cute Monogram idea. I will have to add it to my summer project list. I think it’s so cool how you created stencils with hot glue. Totally going to try this! I love this. Can be totally personalized! It will be interesting to see how this project turns out and what you do with the letter for other projects. This is really a cute project. Something I think Isa would really like to make. That's a great idea indeed. I actually have my daughter's name in wooden letters across her room. This is adorable. I want to make some for the girls. See also more and compare for best prices deals for Kids Room Decor here!